Thank you for participating in our study! 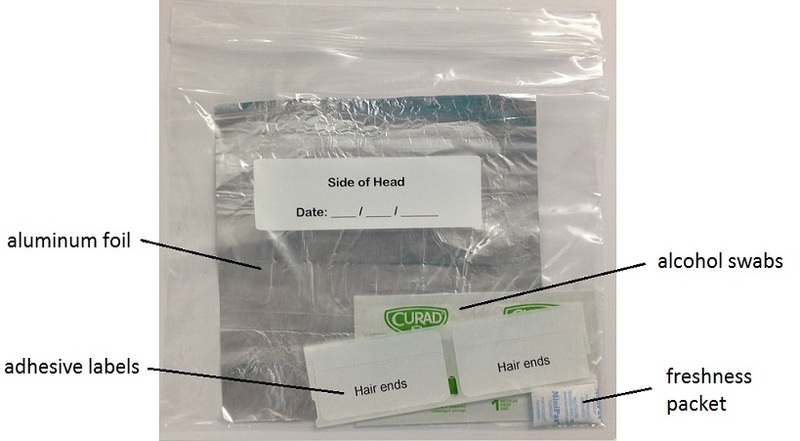 The following instructions explain how to collect your hair samples and mail them back to our study. 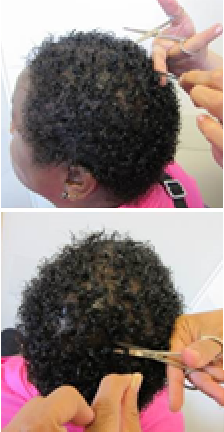 We will use your hair sample only to measure the amount of medication in your hair. Please read this entire page before starting. 1. Gather your supplies in a comfortable, private, and well-lit location. You may want to ask a friend to assist you. 2. Clean the blades of your scissors. Use an alcohol swab to clean the blades of your scissors and allow them to dry completely. 3. Prepare a section of your hair from the side region of your head. 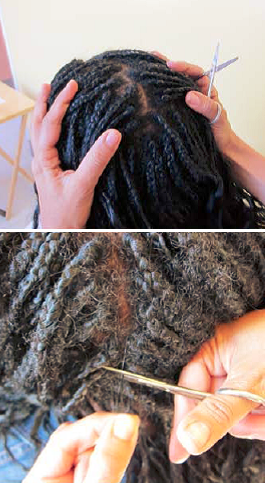 Lift up a top layer of hair from the side of your head. Use a hair clip to keep the top layer of hair out of the way if you have longer hair. Grab a small lock of hair from underneath this top layer. 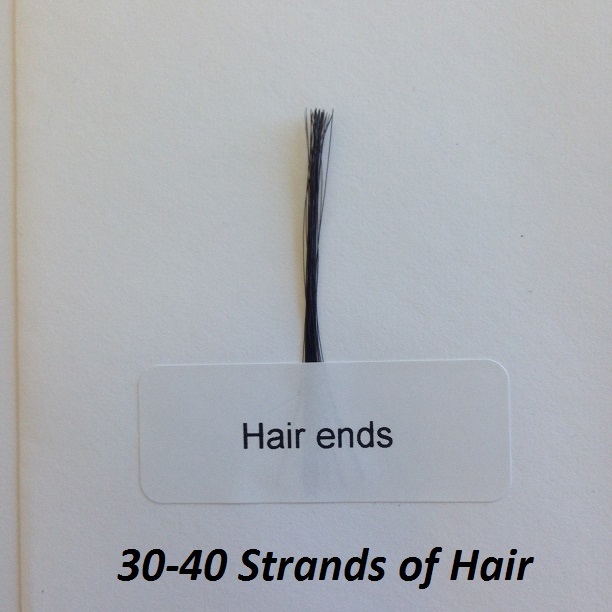 You will need 30-40 strands of hair. 4. Cut your hair sample as close to the scalp as possible and place it on one of the pieces of aluminum foil. 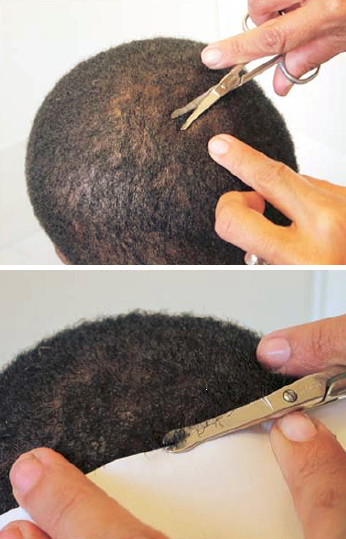 Cut the lock of hair as close to your scalp as possible (slide the scissors right up to your scalp). If your hair is very short, allow it to fall directly onto the foil. If your hair is long enough, place one of the “Hair ends” adhesive labels over the end furthest away from the scalp, taping it to the foil. 5. Fold over the foil to cover your hair sample and place it back inside the Ziploc bag. 6. Label the Ziploc bag with today’s date and prepare for mailing. On the label attached to the outside of the Ziploc bag, fill in today’s date. Make sure the freshness packet is still inside the Ziploc bag. Close the Ziploc bag and place it inside the pre-stamped envelope addressed back to our study. 7. Mail your hair sample. Seal the envelope by removing the adhesive strip, and drop the envelope in any USPS mailbox.